Sergio and I continue to a sloth shelter, where, waiting for the tour, I sit in a café. Leaves are falling next to me… remembering the advice from a guidebook, I check the tall tree crown for toucans or howlers, but cannot see anything… ouch, something else fell, a small piece onto my face, a bit like Cindy Crawford’s beauty mark, and a good fist-sized pile next to me… The waiter appears, apologizing: “Sorry, I haven’t seen you, otherwise I would warn you, that table belongs to that green iguana”. Back home, bird poo on oneself is seen as a good omen, the same must go for the iguana poo here (but that guidebook made no mention of it?). And if the amount is taken into consideration, I guess this has to be a much better omen. However, it didn’t stop an elderly couple, who were at the café at the same time, to giggle whenever they saw me during the tour. I am in Puerto Viejo de Talamanca, in the very southeastern corner of Costa Rica. And I wouldn’t mind spending the rest of my life here, the town has that kind of feeling. In the off season, at least. From there, we head to a local restaurant to join the rest of the team for lunch, an excellent fish spiced by a reggae/calypso band in the background. Having mobility issues, I skipped their hike through the forest and some 30 metres climb up the Kekoldi raptor-watching tower. A river of raptors, to be more precise. This morning, they have seen some 10,000 Broad-winged Hawks, mixed up with two dozen Swainson’s Hawks, several Mississippi Kites and one or two King Vultures, Swallow-tailed and Double-toothed Kites, Merlins and Peregrine Falcons. Being an absolute beginner in the New World, I wasn’t focused on about 95 or so regional endemics – but on every bird I see. Or a mammal. Or even those pooie reptiles. On day one I was surprised and captivated by those unbelievably colourful ones, such as the Great Green Macaw or all those tanagers, but on day two I realized that however beautiful, those colourful ones are easy to ID. Somewhere else, the tricky group would be the LBJs, a.k.a. 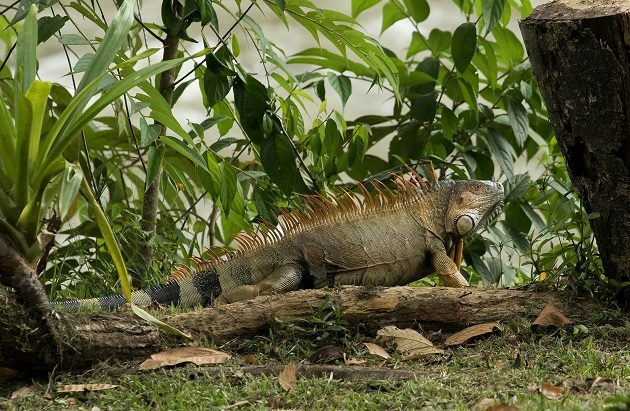 the little brown jobs, but here they are the LGJs, the little bright-green jobs, so well hidden among the lush vegetation of the Caribbean lowlands. Beside those quintessential tropical birds, I had one very ordinary personal goal: I wanted to see the Blackburnian Warbler. And on my day one, in Virgen del Socorro I IDd my first ever Blackburn female. But why would someone look for that, an easy and common one among the 920+ bird species of Costa Rica? It was the spark bird that has triggered one of the greatest birding adventures of all times, Phoebe Snetsinger’s spark bird. And I saw my first Blackburnian Warbler! 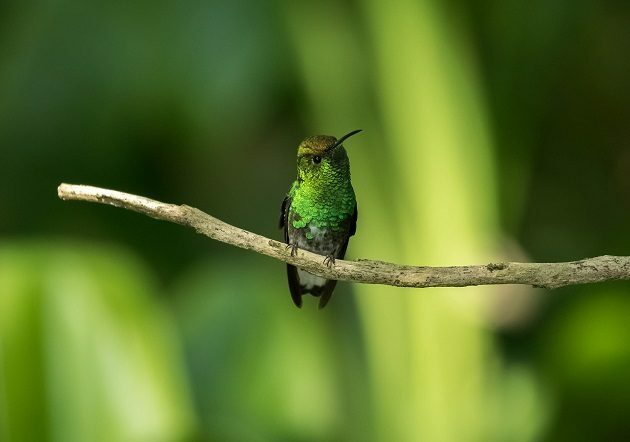 To me, it was as intoxicating as the country’s endemic Coppery-headed Emerald, which I saw earlier that same day at Cinchona (this same individual from the cover photo by Niklas Aronsson). After lunch, the next stop is the Selva Bananito Lodge, across the Bananito River and through three more creeks, where we find Jurgen Stein, the owner, waiting for our minibuses with two 4x4s. The 850 hectares / 2,000 acres farm turned into a private reserve is reachable by ordinary cars but once inside, there is a hundred metres / 300 ft drive through a river. 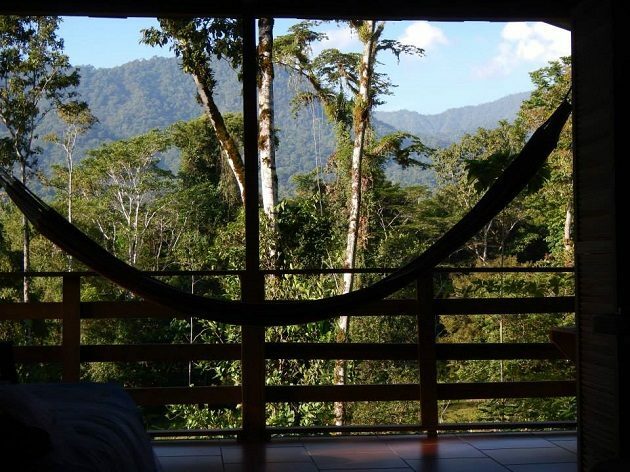 The lodge itself lies at 80 m / 260 ft a.s.l., but the property continues uphill into the foothills of the Talamanca Mountains to more than 600 m / 2,000 ft, and those higher reaches are overgrown with primary rainforest that adjoins one of the biggest transboundary conservation areas in Central America, La Amistad National Park (1 million hectares / 2.2 million acres). The lodge is self-sustainable, relaying on solar panels, producing some of the foods and buying the rest locally, hiring and training local villagers, supporting the local village school, etc. Its cabins stand on stilts, Caribbean style, and are built from salvaged tree stumps left after the logging operations in the past, each with a spacious veranda with a hammock and views of the surrounding forest. We reached the lodge at sunset, to find candle flares illuminating our path to the dining area where Jurgen was proud to show us his certificate of excellence: the camera trap photos of jaguars made within his property. On 58 occasions, camera trap infrared beams were crossed by a passing jaguar. Working with the local jaguar conservancy, he learned that there are 10 or 11 different animals hunting peccaries and other prey at Selva Bananito. And a proof that a good-sized population of these apex predators use the reserve is a certificate that all lower links of the food chains are also present in this ecosystem. Next morning, my phone woke me up at 4.30, to join the team at the dining area for some coffee at 5 and start birding 15 minutes later. The only difference in the next 8 days will be an earlier wakeup call, at 4.20, but coming from Europe and suffering from jet lag, it wasn’t as bad as it sounds. Together with one of his nature guides, Jurgen took me for a bird drive along the lower lying areas of the property. The Selva Bananito Lodge eBird hotspot has 381 bird species at the time of writing, including such specialties as the Great Curassow, King Vulture, Spectacled Owl and the Sunbittern. Yet, this private reserve is a strange place where nature is allowed back, to reclaim what is rightfully hers. 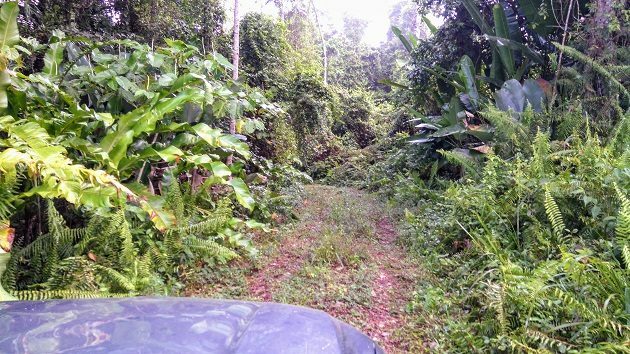 Once it was used as a farm to grow cocoa, bananas, then there was an attempt to grow oil palms, also some sensitive crops that require semi-shade, so Jurgen’s grandfather has planted coconut palms to provide shade. But nowadays, wilderness is crawling, sneaking, thriving and flourishing back, occupying every square foot of the farm once again. 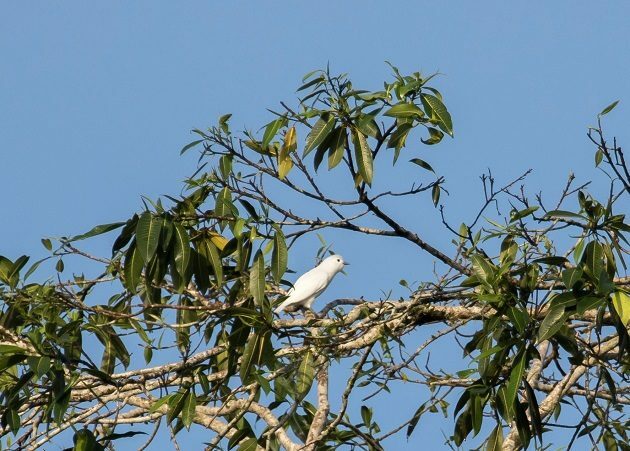 The best birds of our short visit turned out to be the Great Jacamar, Central American Pygmy-Owl, Great Potoo, one surprising and noisy flock of Red-fronted Parrotlets and, on our way out, a dozen Snowy Cotingas adorning the very top of a large mahogany. On the way north along the coast, towards Limon, we were looking for shallow lagoons at river mouths to search for shorebirds and found Grey, Collared and Semipalmated Plovers; Whimbrels, Ruddy Turnstones, Sanderlings, Least, Semipalmated, Western and Spotted Sandpipers; Willets, as well as Greater and Lesser Yellowlegs. Further away, above the waves were Brown Boobies, Royal Terns and pterodactyl-looking Magnificent Frigatebirds. No one was smoking, but the sea breeze was still strong. From the Caribbean lowlands, our route took us to the very gem of these lowlands, the place where legends are born, and afterwards to the top of a volcano, but I will tell you more about that in a month. In two weeks, expect both humid central and dry northern Pacific lowlands. And more macaws. And frigatebirds.